Happy Easter and just say no to peeps! Today was Easter Sunday and as it was a wet and dank day outdoors, I spent my time inside doing exciting things like cleaning, laundry and the dishes. Woo and hoo, as they say. I did another full workout and I believe I have figured out how to exercise without injuring myself, proof that I can still learn even when I should be having a mid-life crisis or something instead. 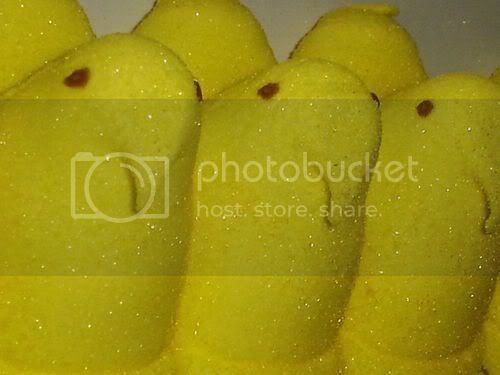 Regarding peeps, this Easter-related “confection” is one of those candies that just seems wrong no matter how you look at it. I’m sure it actively destroys cells in your body upon consumption. On the plus side, peeps can probably double as insulating foam on the shuttle if NASA runs out. These things have a half-life that would make Strontium-90 jealous. Say no to peeps!